I was so inspired today that I needed to post to my poor, neglected blog. All of you who are from CLE and are my age remember 107.9 The End and that it was the “Alternative” with a Capital “A” station that swooped in unexpectedly in 1992…the station spending 24 hours playing “It’s The End of the World as We Know It” by REM over and over…between classes at school asking people with Walkmans if it was still playing that same song…”What could it be!?!?! ?”….then sadly disappearing in the same EXACT way in 1999, but this time not before a DJ locked himself in the studio for a couple hours that morning ranting about the injustices of the corporate culture of radio…24 hours of anguish as I listened to REM over and over wondering what was up to find the next day MY station was gone, and replaced by a station playing some of the more misogynistic “hip hop” of the day. Fast forward to August 2012, me in an uncomfortable suit sitting in the lobby of Entercom-Seattle waiting for my interview. I researched the company before coming in. One of their 4 stations? 107.7 The End. “Classic Alternative” and new music. I’m nervous, obsessing over my resume, and what do I hear over the sound system? Um, are you there “god”? It’s me! Jennie! The End was celebrating it’s 21st birthday in Seattle. In Seattle. And I nailed the interview. And I got the job. And I love it. 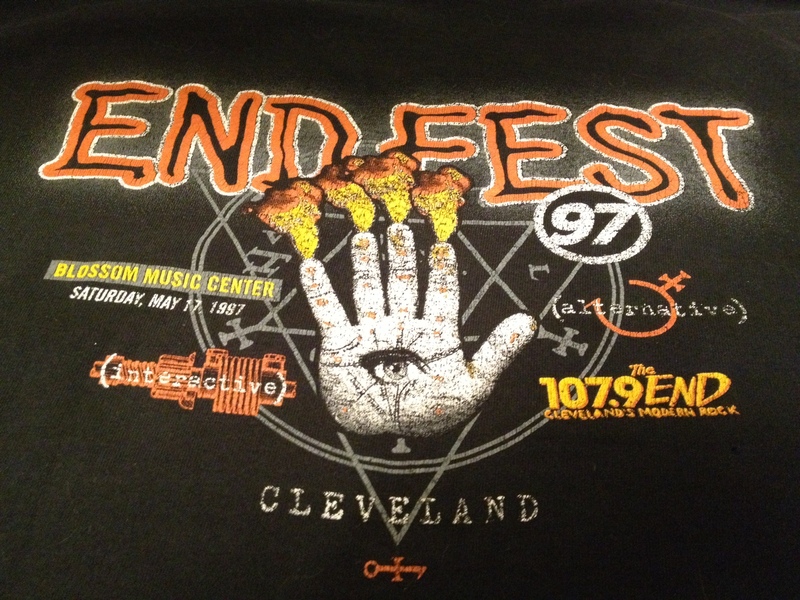 And today (casual Friday), just because I was feeling nostalgic I decided to wear my EndFest 1997 shirt to work. To one or two of them I explained The End in Cleveland (I’m unclear on the technical connection…I know it exists but it’s surprisingly loose)…how it was cut off so suddenly and brutally in 1999. How I can’t find many photos on Google because it was before Facebook, Twitter, MySpace, affordable digital cameras…and film was EXPENSIVE to process for a broke college student. And that none of us really realized what a huge moment this was…how important…until it was gone. It was The End of the World as I knew it. And I feel fine. This entry was posted in Adventures in the Cube Farm, Art, Cleveland, Music and tagged Alternative, EndFest, Music, The End. Bookmark the permalink.